The Foreign Ministry will hold a press briefing at 10 a.m. on August 30 (Wednesday) at the Blue Hall. Foreign Minister Wang Yi will brief the press on the 9th BRICS Summit and the Dialogue between Emerging Market Economies and Developing Countries. We welcome your attendance. Q: The DPRK announced that it successfully launched an intermediate ballistic missile. Some countries have reacted strongly, saying that it is a violation of the relevant resolutions of the Security Council and will seek actions at the Security Council. What is your comment? A: I have noted the relevant situation. The Security Council has clear stipulations in the relevant resolutions regarding the DPRK's use of ballistic missile technology for launching activities. 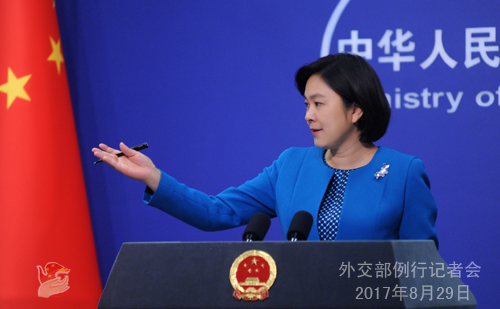 Under the current circumstances, China urges all relevant parties to refrain from provoking each other and heightening regional tensions. All parties shall exercise restraint and work together to maintain peace and stability on the Korean Peninsula. Q: The US and Japan call on increasing pressure on the DPRK. Will China join in their call? What does China think increased pressure means? A: With regard to your question, I wonder whether the US, Japan and the ROK have ever considered that the round after round of military exercises and ever-increasing military pressure have made them feel more secure, or less secure. After seeing the vicious spiral of tension, do they think they are closer to the gate of peacefully resolving the Peninsula nuclear issue or farther? The past has proven that pressure and sanction only will not fundamentally settle the issue. The Peninsula nuclear issue, as a long-standing one, is intricate and complex. The only right solution is to resolve the legitimate security concerns of all parties in a balanced way through dialogues. That represents the way to break the vicious cycle of endless nuclear tests, missile launches and military drills. The suspension-for-suspension proposal China put forward accommodates the legitimate security concerns of all parties, serves to draw everyone back to the negotiating table and seek a balanced and comprehensive solution through dialogue and negotiation, and ensure long-term peace and stability of the Korean Peninsula. We hope all parties could take our initiative seriously and give it some serious thoughts. Follow-up: What is China doing to initiate dialogue? A: Everyone bears witness to what China has done. We have been comprehensively and thoroughly implementing the Security Council resolutions in a balanced way. In the meantime, we also call on all parties to exercise restraint and remain cool-headed about the current situation. We put forward the "suspension-for-suspension" proposal and the "dual-track" approach. All parties directly concerned and stakeholders in the Peninsula issue should shoulder their due responsibilities and play a constructive role so that the situation could return to the right track of cooling down and persuading all parties to return to the negotiating table as soon as possible and properly resolve the issue through dialogue. 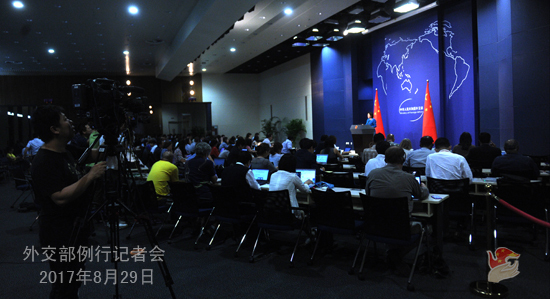 Q: China has been calling on all parties to exercise restraint and remain calm on the Peninsula nuclear issue. But the DPRK continues with its missile launches. Does that mean that China has lost its influence on the issue? A: I don't know for how long you've been reporting on the Peninsula nuclear issue and how familiar you are with China's efforts and the words and deeds of other parties. The nature of the Peninsula nuclear issue is the security issue, the crux being the contradiction between the DPRK and the US as well as between the DPRK and the ROK. The knots shall be untied by those who got them tied. Only when the legitimate security concerns of directly concerned parties are taken good care of can the Peninsula issue be resolved once for all. China has been making unremitting efforts for a peaceful settlement of the Peninsula nuclear issue. Before questioning whether these efforts are effective or not, I suggest you think about the scenario when China calls for restraint, calmness and dialogue, while directly concerned parties keep conducting military exercises and ratcheting up military pressure, against the background of flying missiles launched by another party. Then, who should take the blame and who should do more? The UN Security Council has adopted relevant resolutions which on one hand implement measures to stop the DPRK's nuclear and missile programs and on the other hand call for the resumption of the Six-Party Talks. I would like to invite all relevant parties to ask themselves and answer the question whether they have been comprehensively implementing the resolutions and how much they have done to promote the resumption of peace talks? Q: According to press reports, the US once proposed August 30 as a deadline to finish the deployment of the THAAD system. We noticed that some ROK civil groups rallied in front of the US Embassy in the ROK on August 28, protesting that the US may use the US-ROK defense ministers' meeting on August 30 to press the ROK to finish the THAAD deployment. What is your comment? A: I would like to reiterate that China's firm opposition to the deployment of THAAD is clear, consistent and unwavering. The deployment of THAAD in the ROK will not address the security concerns of relevant countries. To the contrary, it will severely undermine regional strategic balance, jeopardize the strategic security interests of regional countries including China, exacerbate tension and antagonism on the Korean Peninsula, and further complicate the Korean Peninsula nuclear issue. China strongly urge the US and the ROK to take seriously the security interests and concerns of regional countries including China, and to immediately halt the deployment process. Q: Ecuador's court has sentenced about 20 Chinese fishermen for illegally fishing in the protected zone in the Galápagos Islands. The Ecuadorian government has protested to the Chinese government. What is China's response? A: Yesterday I said that the Chinese government opposes all forms of illegal fishing and adopts a zero-tolerance attitude towards illegal trading in endangered wildlife and the products derived from them. We will not condone illegal fishing in any form. After learning that the Fu Yuan Yu Leng 999 was detained by Ecuador on the grounds of allegedly illegal fishing, relevant departments of fthe Chinese government, attaching great importance to this case, immediately ordered investigation and verification works on the relevant situation. Judging from the information gleaned from the two sides, there has been no evidence proving that the vessel was engaged in fishing and transporting in the Ecuadorian waters. But, unaware of the relevant rules of Ecuador, the vessel did sail in the marine protection zone of the Galápagos Islands without permission of the Ecuadorian government. As for whether this vessel was involved in transporting in the high seas, the Chinese government will carry out due investigation and verification. Any illegal actions, if found, will be severely punished by international law and China's domestic laws. China attaches importance to the concerns of Ecuador over the marine protection zone of the Galápagos Islands and will ask Chinese fishermen to strictly observe relevant laws and regulations of Ecuador and to avoid sailing into the relevant waters. 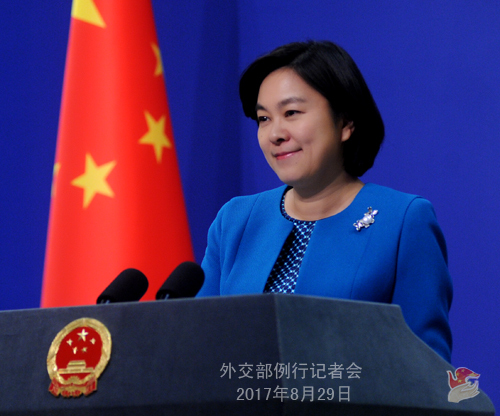 China has noted the sentence delivered by the Ecuadorian side. We hope that Ecuador will deal with this case in a just and unbiased way based on the objective facts and guarantee the legitimate and lawful rights and interests of the Chinese crew. Q: Has China stopped building roads in the Dong Lang area? A: China has said clearly that all the trespassing personnel and equipment of India have been withdrawn to the Indian side of the boundary, and The Chinese border troops continue with their patrols and stationing in the Dong Lang area. China has long been carrying out infrastructure building, including roads, in the Dong Lang area to meet the needs of guarding the border and to improve the living and working conditions of the troops stationed there and people living there. Taking into account various factors like the weather, we will make proper building plans in light of the actual situation. Q: The sanctions have made no contribution to solving the problem till now. Would the Chinese government agree with this? A: I would like to hear your opinion on that. The Security Council has adopted several resolutions, and the sanctions are getting tougher and tougher each time. Do you think they have worked so far? Follow-up: I am just a journalist. What we can see is that there have been many rounds of sanctions now, but the nuclear tests keep happening. So some say that the sanctions have worked while some say not. A: You just answered your own question. Just like what you have concluded after observing and analyzing, and I believe everyone feels the same way, the Security Council has passed several resolutions, and sanctions never stop, but do they really have any actual effects? Everyone notices that sanctions and missile launches are happening side by side. That is why China has been working so hard and relentlessly to advocate the "suspension-for-suspension" proposal, because we believe that only by addressing the legitimate security concerns of all parties in a balanced way can the intricate and complicated Peninsula issue be peacefully resolved and the vicious cycle of more sanctions followed by more missile tests be fundamentally cut off. I suggest all parties calmly and meticulously study the relevant resolutions passed by the Security Council. The resolutions consist of at least two parts. The first is to take actions to curb the nuclear and missile development of the DPRK. The second is to support the resumption of the Six-Party Talks and stress the importance of all relevant parties to take measures to reduce tensions on the Peninsula. Therefore, to those who simply cannot stop talking about sanctions, I would like to ask them whether they have been comprehensively and earnestly implementing the Security Council resolutions in a balanced way? Or rather did they put undue amount of emphasis on sanctions while making no efforts to create necessary conditions and environment for the resumption of the Six-Party Talks? Once again, I urge all relevant parties to give serious thoughts to the "suspension-for-suspension" proposal China raised as a practical, feasible, fair, unbiased and effective way out of the current malaise. Q: A US cybersecurity company says that China has been increasing its cyber espionage attacks in Vietnam. Do you have any comment on this? A: I haven't seen the relevant report and I'm not aware of the information. But China's relevant stance is very clear and consistent. We oppose all forms of cyber espionage and illegal cyber activities. We are willing to work with various parties to build a peaceful, secure, open and cooperative cyberspace. We oppose any country or party's irresponsible accusations against other countries without solid evidence, which won't help with mutual trust and cooperation on the issue of cyberspace. Q: We all hear your repeated calls for consideration of talks. But given the fact that today's missile flew over populated areas of Japan, doesn't this missile launch deserve special condemnation? A: I just stated China's principled position. The Security Council resolutions have explicit stipulations concerning the DPRK's launch activities using ballistic missile technology, and the Chinese side is opposed to the DPRK's launching activities in violation of the resolutions. I just pointed out the Korean Peninsula nuclear issue is a complex one. It should be stressed that various parties need to undertake their own responsibility and make their own effort to ease the tension. The current development of the situation has just proved once again the fact that sanction and military pressure alone will never be the final way out. At present, the situation is indeed nearing the critical tipping point of crisis which could also be a turning point for us to return to peace talks. We hope various parties can seriously think about how we can truly and fundamentally reduce tensions on the Korean Peninsula, peacefully resolve the Korean Peninsula nuclear issue and achieve peace and stability on the Korean Peninsula. We have noted that recently both the US and the ROK stated publicly that the peaceful settlement of the Korean Peninsula nuclear issue best serves the interests of various parties. Since we have all recognized that, what we need to seriously think about is how to achieve it. We hope various parties can carefully study the relevant Security Council resolutions and make concrete effort for an early resumption of the peace talks and the peaceful settlement of the Korean Peninsula issue. Q: Could you tell us that how many Chinese soldiers are still deployed at the Dong Lang area? A: This is a very specific question. What I can tell you is that The Chinese border troops continue with their patrols and stationing in the Dong Lang area. China will adjust and deploy its military resources in accordance with the need of guarding the border and the situation on the ground. Q: China thinks that the sanctions were not successful, but China still supports those sanctions of the UN Security Council. And now the US and Japan called for another meeting of the Security Council, will China support another resolution on condemning the DPRK and calling for new sanctions? A: On the Peninsula nuclear issue, China has been upholding an objective and unbiased attitude and playing a positive and constructive role based on the merits of the issue. We have voted affirmatively to the relevant resolutions of the Security Council, so there is no question that we will earnestly implement them 100 percent, including sanction measures. On the other hand, as I just said, we hope that all parties could implement the resolutions comprehensively, accord equal importance and attention to the resumption of the Six-Party Talks which is also supported by the resolutions, and make their contributions to alleviating tensions and peacefully resolving the Peninsula nuclear issue through peace talks. You mentioned that some countries called for another Security Council meeting. We hope the discussion in or the action of the Security Council can help realize the general goal of peacefully resolving the Peninsula issue and maintaining peace and stability on the Peninsula. That is what China has been doing, and that is what China will continue to do. Q: In response to the DPRK, the ROK and the US national security adviser H.R. McMaster discussed potentially deploying strategic assets in the ROK. Would such a development be a concern of China? A: A: I don't know what the "strategic asset" in the discussion between the ROK and Mr. McMaster as you mentioned means. Our stance is very clear. The current situation on the Korean Peninsula has been highly complex, sensitive and fragile, we hope various parties can remain calm and restrained, and refrain from any action that may escalate the situation and show their good faith in peacefully resolving the Korean Peninsula issue and upholding peace and stability there with concrete actions. Q: It is reported that the meeting of the Joint Working Group on the Implementation of the DOC will soon be held. Can you confirm it and give us more details? A: China and ASEAN member states will hold the 22nd meeting of the Joint Working Group on the Implementation of the DOC on August 30 in Manila, the Philippines. All sides will exchange views thoroughly on implementing the DOC and promoting maritime practical cooperation and consultations on the COC. At present, thanks to the concerted efforts of China and ASEAN member states, the situation in the South China Sea has cooled down and showed positive momentums towards stability and continuous improvement. Back on the track of dialogues and consultations, all relevant parties commit themselves to comprehensively and effectively implementing the DOC and jointly ensure peace and stability of the South China Sea through managing disputes, enhancing mutual trust, and promoting cooperation. China would like to work with all parties to sustain the momentum of dialogue and cooperation and strive for more outcomes and positive progress so as to get a good start-off for the next-step consultation on the COC. Q: There have been reports that the Dong Lang boundary dispute with India has been settled now because the BRICS meeting is taking place in China. Do you agree with this kind of reports? 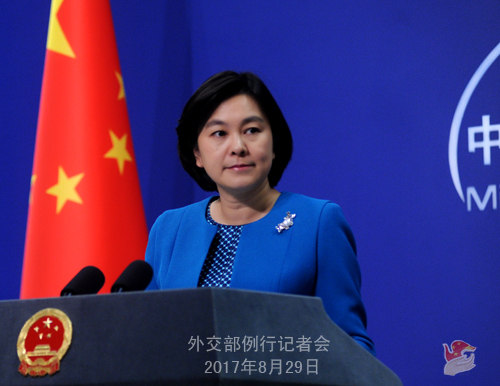 A: I have stated China's stance on the withdrawal of the illegally-crossing Indian personnel and equipment. The BRICS Summit in Xiamen is an event for all BRICS countries. A successful BRICS Summit serves the common interests of BRICS and developing countries. As Chair, China stands ready to make active efforts and play a positive role in ensuring the success of this event. We hope that other parties of this meeting can also show their support and cooperation. Q: The sanctions have yet been proven to be successful. If the US and others seek fresh sanctions at the UN Security Council, will China agree? A: You raised a hypothetical question and I don't want to answer it. I have elaborated on the issue for a while and China's view has already been made very clear. First, we hope the discussion in or the action of the Security Council can help realize the general goal of peacefully resolving the Korean Peninsula issue. Second, we don't think threat, pressure or sanction can offer a final solution to the issue. We hope that various parties can comprehensively, earnestly and faithfully implement the Security Council resolutions in their entirety. On the one hand, we need to take effective steps to curb the DPRK's nuclear and missile development; on the other hand, we should take concrete actions in a responsible way and create conditions for proper settlement of the Korean Peninsula issue through peace talks as soon as possible. Q: China obviously supported sanctions. So are you saying that sanctions alone cannot solve the North Korea situation? A: What I said is that since China has said yes to the relevant Security Council resolutions, we will follow through on them faithfully and earnestly in their entirety, including those sanctions-related parts. In the meantime, we hope various parties can give equivalent importance to the other parts of the resolutions, namely, taking measures to deescalate the tensions on the Korean Peninsula, promoting the resumption of peace talks and seeking the settlement of the Korean Peninsula through peaceful, diplomatic and political means.